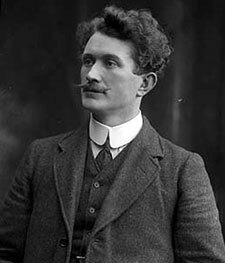 THOMAS ASHE was born on 12 January 1885, in Lispole, County Kerry. A teacher, he was a member of the Gaelic League, the Irish Republican Brotherhood (IRB) and a founding member of the Irish Volunteers. Commanding the Fingal Battalion of the Irish Volunteers, Ashe took part in the 1916 Rising. Ashe’s force of 60 to 70 Volunteers engaged British forces around north County Dublin during the Rising. The battalion won a major victory in Ashbourne, County Meath, where they engaged a much larger force, capturing a significant quantity of arms and up to 20 Royal Irish Constabulary (RIC) vehicles. Twenty-four hours after the Rising collapsed, Ashe’s battalion surrendered on the orders of Pádraig Mac Piarais. On 8 May 1917, Ashe and Eamon de Valera were court-martialled and both were sentenced to death. The sentences were commuted to penal servitude for life. Ashe was imprisoned in Lewes Jail in England. Ashe took part in the republican prisoners’ hunger strike that began on 28 May 1917. Following a successful campaign outside the jail to complement the efforts of the striking prisoners, Ashe and the remaining POWs were freed on 18 June 1917 as part of a general amnesty. On his release, Ashe returned to Ireland and began a series of speaking engagements. In August 1917, Thomas Ashe was arrested and charged with sedition for a speech that he made in Ballinalee, County Longford, where Michael Collins had also been speaking. He was detained at the Curragh but was then transferred to Mountjoy Prison in Dublin. He was convicted and sentenced to two years’ hard labour. Ashe and other prisoners demanded prisoner of war status. Administered by a trainee doctor, the process of feeding was often quite brutal. On the third day, Ashe collapsed shortly after the brutal procedure. It was later discovered that the tube had pierced his lung. Other complications also occurred. He was released immediately from the prison and taken to the nearby Mater Hospital. Two days later, on 25 September, he died of heart and lung failure. Ashe’s death had a significant impact throughout Ireland, increasing republican recruitment and support for the independence struggle. After lying in state at City Hall, Ashe’s cortege made its way through Dublin to Glasnevin Cemetery on 30 September. It is estimated that 30,000 people lined the streets, some having travelled great distances at a time of limited transport to attend the funeral. He left the public in no doubt as to what would be required in the time ahead to gain independence. The brutal manner of Ashe’s death, superimposed upon the summary executions of the 1916 leaders and other atrocities committed by the crown forces, galvanised the nation. Committees sprang up all over the country to pay tribute to the memory of Ashe and this further fuelled the independence struggle. Thomas Ashe died as a result of forced feeding on 25 September 1917, 88 years ago this week.